I reviewed a previous Inspector Banks novel by Peter Robinson some time back, and my review says I liked it. But I never read another for some reason. I purchased Sleeping in the Ground to try him again. My reaction follows. On a beautiful day in northern England, outside an ancient church, a wedding party comes under sniper fire. Several people are killed, others injured. 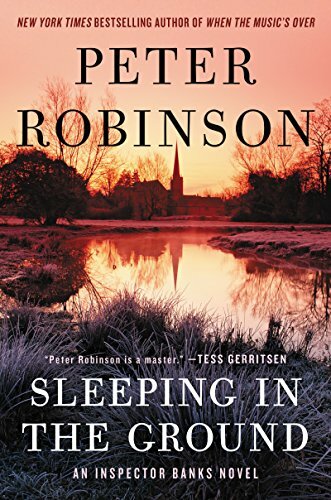 Inspector Alan Banks and his team come in to investigate, and soon settle on a suspect – a quiet local man who belonged to a gun club and owned a rifle. When he is found dead in his cellar from a self-inflicted gunshot, the case seems closed. But it isn’t. Banks’s superior (and others) want to learn why this uncomplicated man – none of whose acquaintances can believe he would kill anyone – could have gone off the rails so. The trail leads to an old murder and a resentment long cherished. I can’t complain about the writing in Sleeping in the Ground. The prose is good, the characterizations convincing. My objection is ethical – though many would call it emotional. I’m tired of female cops and female action heroes. It seems to me (subjective judgment) that more than half the mysteries written today are written by women, and even more than that are about woman detectives. I thought I was fairly safe reading an Alan Banks mystery. But little did I know that in the course of his fictional career, Banks has become the head of a unit composed almost completely of women – all attractive, of course. There are a couple male detectives around, but they don’t have a lot to do (Are 80% of the detectives in England really female?). I’ve said before that I consider it morally wrong to put women in harm’s way. The women go in harm’s way all the time in this book, and the final showdown between an ethereally-beautiful-but-tough woman detective and the villain went far beyond the bounds of plausibility. For me. Your mileage may vary, of course. So, final verdict – not a bad mystery, but spoiled for me by “you go, girl” gender guidelines. Cautions for violence, adult themes, and language. Previous PostMerry ChristmasNext PostDid Gingerbread Houses Come from Fairy Tale? I appreciate the sentiments, which I share. I thought I’d look up your percentage question. The UK gov website says there were approaching 30% female police officers in the force throughout the country in 2015. That’s all ranks. Of 200,000 total officers, only 5,000-6,000 are inspectors, maybe 20% of those being female.